If you are looking for a sports bar or a family-friendly dining room in Corolla, N.C., you’ll find plenty of options at Uncle Ike's Sandbar & Grill to satisfy your thirst and tame your appetite. You can order breakfast, lunch and dinner items in both the dining room and our bar every day from mid-May to September with plenty of off-season hours. Our menu displays a variety of appetizers, salads, sandwiches and delicious seafood, pork, beef, vegetarian and chicken entrees. And don't forget our famous fish tacos! Running late? Don't worry, our late night menu is served until 1 a.m.
At Uncle Ike's, we celebrate comfort food with a healthy beach flair offering steamed bar, vegetarian, kid-friendly and gluten-free options. We proudly serve everything fresh and made-to-order. We offer nightly seasonal specials including a delectable selection of homemade desserts! Do you love the outdoors? You can also enjoy your food at our outside deck while enjoying the amazing weather of the Outer Banks. Crispy shrimp tossed in a homemade sweet heat sauce and served with ranch for dipping. Choice of dressing: Ranch, Bleu Cheese, Honey Mustard, Caesar, Balsamic Vinaigrette or Raspberry Vinaigrette. Grilled salmon topped with strawberries, mandarin oranges and bleu cheese crumbles served over romaine. Hand breaded shrimp, fried and served with sweet Thai sauce. Hand breaded fried 12oz. Haddock served with a side of homemade remoulade. Amazingly delicious! 100% vegan, 100% gluten-free patty made from pea protein served with onion, spinach, tomato and a side salad. Grilled fresh fish of the day blackened drizzled with a wasabi mayo and sweet Thai sauce. Topped with lettuce and tomato. Grilled jumbo lump crab cake topped with lettuce and tomato. Served with a side of homemade remoulade. Belgian waffle stuffed with two strips of bacon, topped with two hand breaded chicken fingers and homemade sausage gravy. Served with a side of syrup. Two flour tortillas grilled and stuffed with the fresh fish of the day, salsa, remoulade, shredded cheddar cheese, lettuce and tomato. Served blackened, grilled or fried. Served with the starch and veggie of the day, excluding pasta dishes. Two jumbo lump crab cakes served with homemade remoulade. NC hand-shucked oysters side of crispy fries and homemade remoulade. Mahi blackened over parmesan roasted red pepper grits, grilled broccolini topped with applewood smoked bacon and pico de gallo. Cavatappi pasta smothered in a homemade cheese sauce topped with jumbo lump crab meat and shrimp sprinkled with old bay. Wild caught North Atlantic salmon, grilled, then topped with jumbo lump crabmeat, fresh spinach, tomatoes, mushrooms in a white lime cream sauce. Delicious! Fish of the day, shrimp and jumbo lump crab cake broiled to perfection. Grilled 6oz. 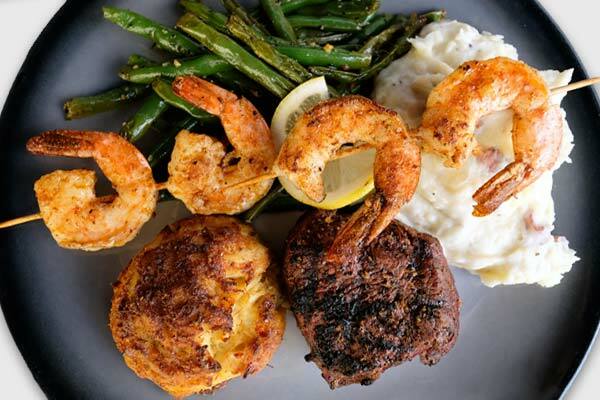 filet, shrimp and jumbo lump crab cake broiled to perfection. Lemon pepper grilled salmon over sauteed mussels with bacon, spinach and tomatoes tossed in a silky white wine garlic sauce and toasted bread. Grilled yellowfin tuna over Asian-style vegetable medley sauteed jumbo shrimp topped with fresh scallions. 6oz. filet over rosemary garlic mash potatoes and sauteed squash and zucchini topped with jumbo scampi-style shrimp. Pusser's Rum with a taste of the islands. Topped with nutmeg. Strawberry puree, 1800 Coconut Tequila, triple sec, sour mix and a splash pineapple juice. A fresh take on an old favorite!